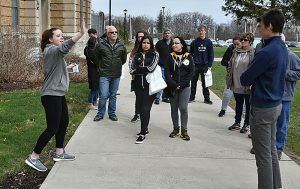 Part of the SUNY Oswego Office of Admissions' many recruitment efforts, a tour group explores the campus during an open house. Students who apply to the college but fall below enrollment qualifications for the current year now receive a promise: Do the necessary work at a partnering community college, and earn a guarantee of admission to Oswego in as little as a year. OSWEGO — Liam Morgenstern really wanted to attend a four-year college, preferably SUNY Oswego, after high school in Chatham. He received a letter that had, instead of a denial, a promise — about the college’s new Admission Promise Program. 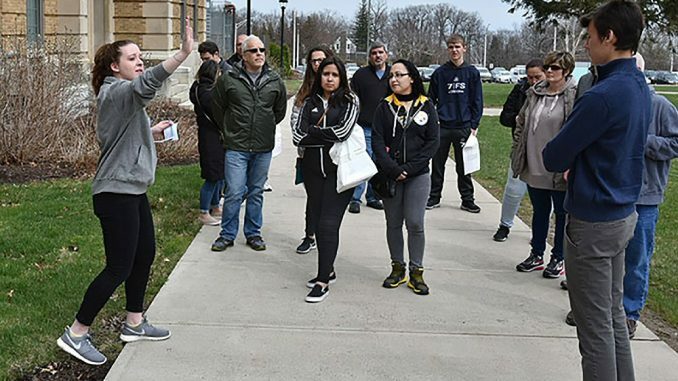 Part of the SUNY Oswego Office of Admissions’ many recruitment efforts, a tour group explores the campus during an open house. Students who apply to the college but fall below enrollment qualifications for the current year now receive a promise: Do the necessary work at a partnering community college, and earn a guarantee of admission to Oswego in as little as a year. SUNY Oswego last spring did away with the traditional “denial” letter for those who don’t qualify initially to attend the college. Instead, Oswego guarantees a pathway for admission — in as little as a year — to those who enroll at a community college and show success. The program piloted last fall when Morgenstern, who now attends Columbia Greene Community College, was applying to four-year schools. “When I read about the Admission Promise Program, I jumped right on it,” he said. “I really wanted to go to a four-year school. I looked into Admission Promise and they said I could transfer after a year in community college with at least 24 credits. I thought, ‘Why not get those credits out of the way and get to Oswego as soon as possible. '” Morgenstern, who will start at the college this fall, majoring in cinema and screen studies, with a minor in photography. Students applying for the Admission Promise Program must first attend a community college and meet a cumulative GPA requirement for the credits they have taken, whether one year’s worth or two. They do not have to reapply to Oswego; they are guaranteed admission as long as they’ve met all program requirements. In all, 60 students who had sought admission to Oswego have applied to attend under Admission Promise — many of them would start in fall 2020 — and applications are still coming in. Morgenstern is among three community college students who opted for the program last fall and have been admitted to SUNY Oswego for fall 2019. Griffin and Craig Green, an associate director of admissions with responsibility for transfers, said the new message of hope for those who initially fall below Oswego’s admission requirements is more positive than the ages-old alternative. The message can be encouraging for students who consider Oswego their “dream school,” and for those who feel pressure to start higher education in a four-year bachelor’s degree program. 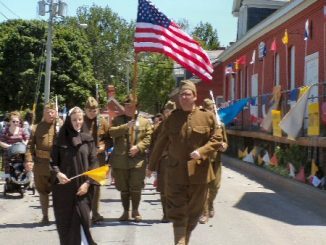 It can actually mean two degrees for some, an associate’s from the community college and a bachelor’s from Oswego, according to Amy Kremenek, vice president for enrollment development and communications at Onondaga Community College. Other partnering community colleges, by and large, have greeted the SUNY Oswego approach with optimism, too, Griffin said. Admission Promise encourages those who are short of Oswego’s requirements to enroll at SUNY’s two-year schools, rather than perhaps going into heavier debt at four-year private schools. In recent years, SUNY Oswego has admitted over 1,400 first-year students each fall and has relied on about 700 transfer students — most from two-year schools — to keep its own enrollment robust. “Each semester, she helped me set up a schedule for credits that I could transfer over. She was very helpful and very nice,” he said. Morgenstern said he is very excited about orientation and the start of classes at Oswego this August. Start Now is primarily intended for students from the New York City metropolitan area who enroll at OCC or Jefferson Community College. It is more structured, with personalized and regular support from Oswego’s Start Now coordinator, Sandra Montalvo, as well as community college teachers, advisors and professional staff. For more information on SUNY Oswego’s Admission Promise program, email [email protected] For Start Now, email [email protected] Call 315-312-2250 to be directed to information about either of those programs or to anyone in the Office of Admissions.